I love Kellogg’s Frosted Mini Wheats! Kellogg’s has accomplished an incredible feat by taking a food product that basically has the consistency and taste of dried, toasted hay and made it delicious by coating it in a thick layer of sugar. To emphasize my point, have you ever eaten plain Shredded Wheat? There are a few brands on the market but Post Shredded Wheat is the most iconic and well-known. Could there possibly be a more disgusting, choke-inducing cereal than plain, shredded wheat? Well, maybe Grape-Nuts, another Post creation. I’m not sure my goats would even eat plain shredded wheat. 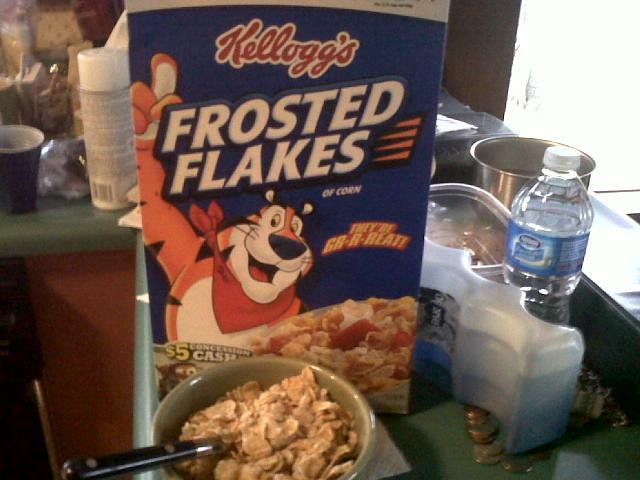 But Kellogg’s has nailed it by adding a sugary coating. It’s a food product that allows us to avoid wallowing in the poor self-esteem issues of our food choices by hiding under the guise of eating healthy and regulating our bowels, while still consuming massive amounts of sugary goodness. Herein lies the problem. When you add milk to your Frosted Mini Wheats the sugar will start to dissolve and they will begin to deteriorate faster than the most aggressive of ionic reactions. Precipitation of BaSO4, Barium Sulfate, when solutions of Barium Chloride and Sulphuric Acid are mixed. Now I’m no scientist, but those speeds sound like some serious business! Those are negative powers bro! I’d venture to guess that the significant deterioration of a Frosted Mini Wheat in a bowl of milk starts happening in about 10-25 seconds. So, just as you would never in your right mind try precipitating Barium Sulfate without a well thought out plan of action, you should never eat a bowl of Frosted Mini Wheats without an equal level of preparation. The important thing to note about Frosted Mini Wheats is that Kellogg’s has not figured out how to accurately coat each Mini Wheat with equal amounts of sugar. This will be important later. Pour Frosted Mini Wheats into a bowl. 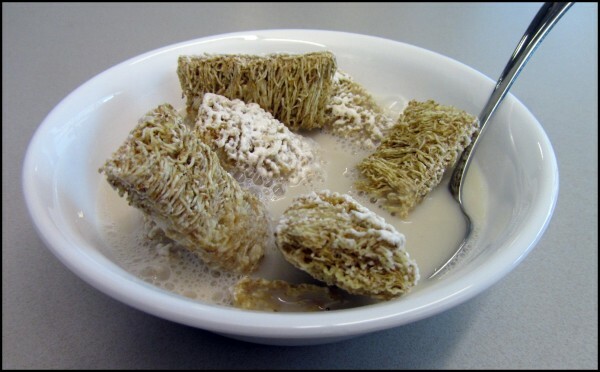 Arrange all of the Mini Wheats so that they are “face up”, meaning sugar side up. You should have no more than two layers of Mini Wheats. If you have more than two layers you will need to return some to the box. As you are arranging the Mini Wheats, carefully study and mentally document each of them to determine the amount and consistency of the sugar that coats each piece. Try to put the Mini Wheats with the most sugar on the bottom layer. Make special note of the one or two Mini Wheats that are coated with an incredibly thick (1-2mm) of sugar-coating. There will always be one or two of these. Prepare yourself mentally to eat the Mini Wheats, i.e. get in “The Zone”. IMPORTANT: Pour milk into cereal bowl but only enough to lightly soak the Mini Wheats. If you use too much milk you will end of with a giant bowl of mush. Eat as fast as you can starting with the least sugary Mini Wheats on the top layer and finishing with the most sugary Mini Wheats on the bottom layer. As the Mini Wheats will shift around while eating, you will need to be fleet-of-spoon to be sure you are continuing to eat in the correct order. The Mini Wheats noted in #6 should be eaten last. If you’re a milk drinker, go ahead and drink the milk, but keep in mind, Frosted Mini Wheat milk will have significantly more “silt” in it than milk from other cereals. So that’s how you eat a bowl of Kellogg’s Frosted Mini Wheats. Next up… How to Eat a Bowl of Lucky Charms! Son: We’ll I guess I can’t have cereal this morning! Me: Why would that be? Son: Because we only have skim milk. Son: I don’t like skim milk, I only like fat-free milk. Me: It’s the exact same thing. Me: Yeah, I’m pretty sure that it’s the exact same thing. Son: It’s not, it’s different. Me: Would you like me to call the U.S. Department of Agriculture? Me: That’s not important, but I’m telling you its the same thing. Son: No it’s not, it tastes different. Me: It doesn’t taste different, what don’t you like about it? 1. Pasta Foods: such as Macaroni and Cheese, Spaghetti, etc. 2. Canned Pasta Foods: such as Spaghetti-O’s, Chef Boyardee, etc. 3. 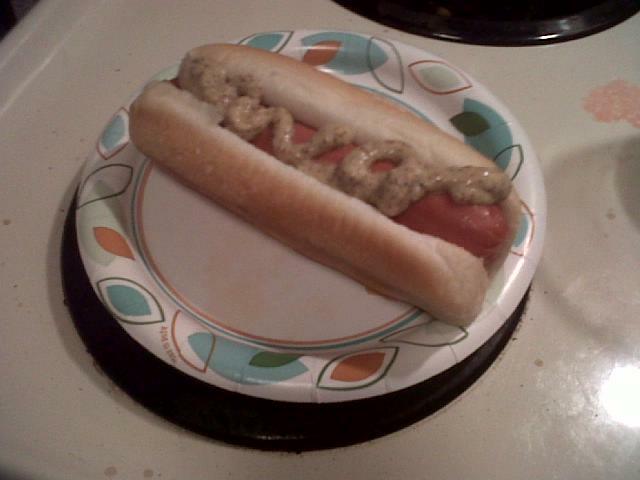 Tube Shaped Foods: Hot Dogs, Corn Dogs, etc. 4. 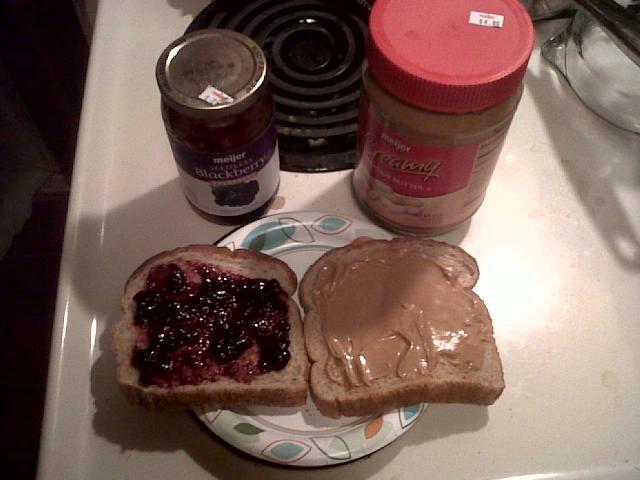 Nut and Jelly Foods: Peanut Butter and Jelly, Jelly Donuts, etc. 5. 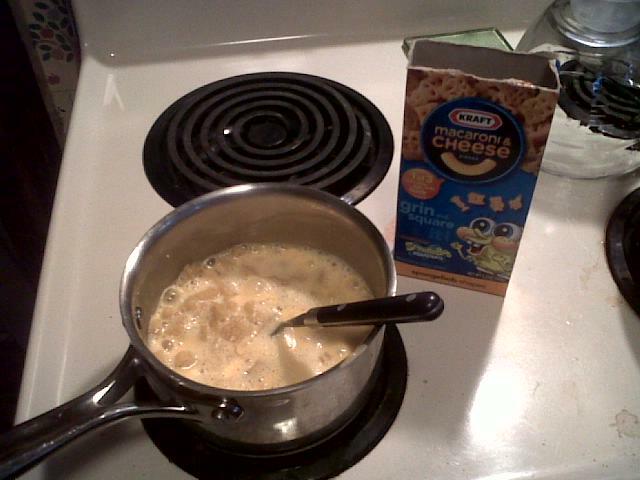 Foods with cool mascots: Cereals, Pop-Tarts, Kid-Cuisine Meals, etc. 6. Foods that used to be chickens: Nuggets, strips, etc. We only drink skim milk at our house. I call it gray milk, because it has that kind of grayish tinge. There are a few different grocery stores around us and some of them sell skim milk and some of them sell fat-free milk so depending on where we shop sometimes we have skim milk and sometimes we have fat-free milk. My son won’t drink skim milk. He’ll only drink fat-free milk. Actually he doesn’t really drink that much milk but he uses it on cereal. In my superior knowledge of worldly things, I’m relatively confident that skim milk and fat-free milk are pretty much the same thing and that there really is no noticeable difference between the two. But he has it in his head that they are different. This is a recently discovered phenomenon so we think maybe he tasted some “skim milk” that was perhaps beginning to go bad at one time and now he thinks that there is a difference. So I did a little research. The website Buzzle.com makes it, as they say, “quite clear”! You can read the whole article here if you want… or just read the conclusion which I have copied below. From the above discussion, it is quite clear that skimmed milk which contains 0.5% fat, is known as fat-free milk. 1% milk is the low-fat milk. 1% and 2% milk can be considered as skim milk. Milk containing 0.5% fat is recognized as either fat-free milk or skim milk. Normally, one cup of skim milk or non-fat milk contains less than 0.5 gm of fat per cup. Skim milk (0.5% fat) and fat-free milk, being the same, do not portray any marked difference in their nutritional value. Fat free milk is just the new term for marketing skim milk which has negligible fat. See how clear that was. I’m always right!